Published September 29, 2014 at 650 × 424 in 2012 An Infinite Scream -Namib Desert. There is a pretty famous old photograph of the Herero Chief Samuel Maharero and Governor Leutwein. Samuel Maharero has sold off much of the land of his people to the Germans for very cheap in return for being helped to fight the Herero people who did not accept him as chief. 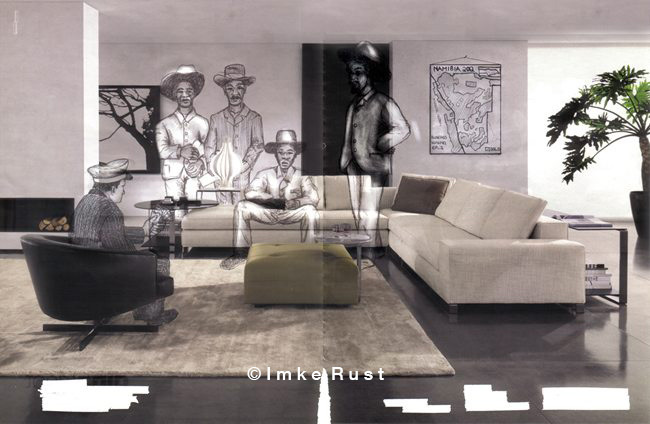 I used this photograph as a reference and drew the people into a modern-day setting (an interior from a magazine) as I imagine similar dubious and far-reaching deals are happening still today, especially in awarding mining concessions. The problem with selling off our countries resources in such a big way, is that we will never be able to get them back. Once they are depleted, they are gone forever and we are left with big scars in the earth and probably a lot of pollution.